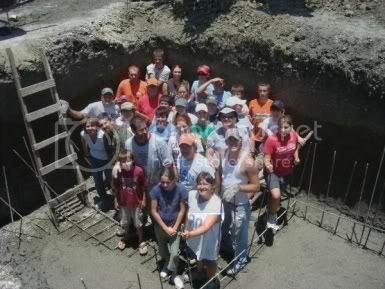 The Good News: "One Shovelful at a Time"
"One Shovelful at a Time"
Wow! Can I just say we have, once again, been overwhelmed by God's goodness, blessings, and provision! We just finished with our home church of Bethel Worship Center in Camden, SC. Let me just put a small plug in here...if you do not have a church home and you are anywhere in the Columbia, Camden, Sumter area and are looking for a church you must at least visit Bethel. I know you may be thinking, "that is a long way to drive" or "with gas prices so high it is not worth the cost" but I will tell you that you are wrong! We lived in Columbia and we drove the 50 minutes each way and we were never disappointed. I would dare to say that even with the gas prices here, $5.75 per gallon of regular I would still pay the price to drive if I were in SC. They are family to us and they receive everyone that comes in the door the same regardless of age, gender, what you wear or how you look... you are a child of the living God and they will love on you just as He does! I don't know what we would do without them, their support and prayers. They had asked us for a "wish list" full of items that are difficult if not impossible to find here, or they cost just too much to even think about buying. Well, once again our Bethel family worked together to fill not one or two of those wishes but filled then ALL and then added items of their own like a new DeWalt tool set. Those of you who know me (Melynda) know that I love tools! They brought us a shop vac which also has been put to use a few times. And just when we thought they were done and we were already speechless they pulled out a new laptop...better and with more memory than the one that was stolen in May. I am still shaking my head in amazement! God's word is true...He says that that which is stolen from you will be returned 7 fold and He did just that! Actually I think it was much more than 7 -fold. ~Placed shower rods and curtains in two bathrooms of what we call "the little house"
~Fixed several plumbing issues in the house. ~Cleaned up all of the remaining rubble, dirt, broken block and such from in front of the first building by loading it one shovelful at a time into a wheelbarrow and wheeling over to fill the footers of the second building. We got smart by the 3rd day we rented a Bobcat to help us out.